Dr. Chopra and Dr. Benedict have been performing cataract surgery since 1987 and have performed perhaps close to 10,000 of these surgeries with excellent results. A cataract is a common condition that causes a clouding of the eye’s natural lens, and affects millions of people each year, including more than half of all Americans over the age of 65. Cloudiness develops as a result of a buildup of protein in the lens. 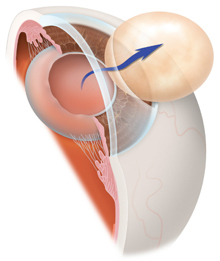 Cataracts cause a progressive, painless loss of vision. The lens clouds naturally as we age, causing people over the age of 65 to see a gradual reduction of vision. The exact cause of cataracts is unknown, although it may be a result of age, injury, certain medications, illnesses (such as diabetes), prolonged exposure to ultraviolet light and smoking. If visual impairment begins to interfere with your ability to read, work or do the things you enjoy, you may want to consider cataract surgery to restore your vision. Cataract surgery is the most commonly performed surgical procedure in the US, and can be performed quickly and easily with a success rate of over 95% and minimal risk of complications. During cataract surgery, artificial lenses are implanted in the eye to replace the cloudy natural lenses. 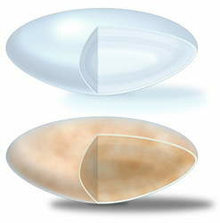 These artificial lenses, known as intraocular lenses (IOLs), were originally not able to correct astigmatism or near vision, leaving most patients dependent on eyeglasses or contact lenses for near vision. Many cataract patients, in addition to suffering from either nearsightedness or farsightedness or astigmatism, also suffer from presbyopia, natural changes to the eyes that occur as we age. Before premium lenses, patients were unable to see clearly at both near and far distances without the use of eyeglasses or contact lenses. Early lens implants were monofocal, meaning that they had only one focal point and could not adjust to varying distances. New advances in technology have allowed for the development of multifocal IOLs, which let patients see clearly at all distances, and can even reduce astigmatism as well. Premium lens implants are ideal for cataract patients who are also suffering from presbyopia and want a replacement lens that provides a full range of clear vision. There are several different types of premium lens implants available for cataract patients. Dr. Chopra and Dr. Benedict will work with you to decide which lens is best for your individual eyes to help you enjoy long-lasting, clear vision at near, intermediate and far distances. To learn more about Premium Cataract Surgery or to make an appointment with us, please call 770-419-1393. "I am so very blessed that you are my doctor. You are wonderfully perfectionist, calm & professional." "Many thanks to you and your exceptional staff for your continued great care." "Thank you for taking good care of my eyes and my family. You are simply the best." "Thanks for giving me back my vision." "I am so very pleased with and grateful for the service I received from Dr. Benedict and the entire staff." "Never had to wait more than a few minutes. Most visits I was in an exam room before my appointment time." "Most visits I was in an exam room before my appointment time." "Thank you! Your surgery on my left eye was barely completed six hours ago and I already feel that your work is the best thing that has ever happened to my eyesight." I have suffered from migraines/headaches for the past 5 years, having 2 -7 headaches a week of varying intensities. I am so pleased that I had this procedure done. I have not had a headache since the left eye was completed. I am almost certain without this procedure, I would have eventually suffered significant sight impairment or lost my eyesight completely. How do you keep your kid’s vision safe?